OnePager is the world’s super simple one page website builder, requires no extra time and labour like playing a game. The only requirement is your artistic taste having ease in mind. Agencia adapts perfectly to all viewing devices in the market and offers a consistent experience across desktops, tablets and phones. 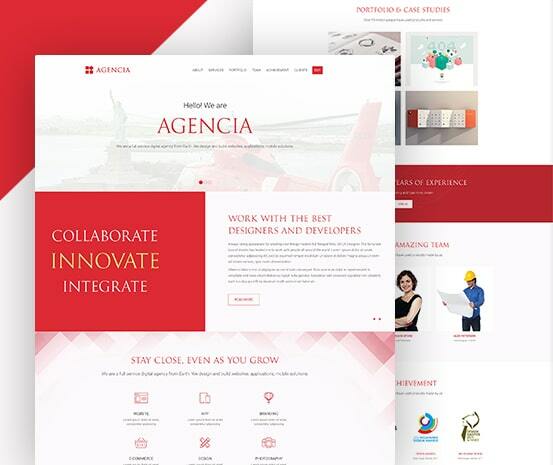 Agencia comes with built in drag and drop one page WordPress site builder which allows to build and customize whole structure and look of a website without touching a single line of code. All thanks goes to one and only OnePager. Following documentation is the key but a laborious task to have quickly hands on the a full-fledge website setup. But Agencia is the trend setter dosest require to read single line of documentation. Thanks to OnePager to be tightly integrated kicking in the unmatched possibilities of instant site setup and infinite customization. ThemeXpert OnePager inhouse team and local OnePager community are in full-blooded to develop unmatched OnePager blocks. The more lucrative blocks would be added in Agencia, the more surplus increase would be added in regular price. To be grandfathered on $39 having all upcoming blocks in bucket, be a Early Bird Member soon. OnePager is the synonymous of unlimited opportunity of helpful features and unmatched possibilities of ultimate customization. So, Agencia comes with 12 preset style variations, with easy configuration of text link, accent, and even background color. Building a website about the brand and personal elegent creation is a polished way to share individual’s expertise with the world. Thanks to Agencia making everything bottled precisely in a single platform. Agencia is bottled with vast array of aesthetic layout variations which allow you to experiment the mysterious conversion.